Rockwell, secretary to the Misses White, sends thanks for the gift of watermelon pickle and requests that they be sent only one copy of the Southern Highlander. 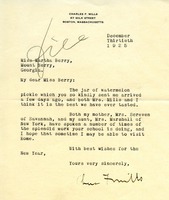 Letter from Charles Mills thanking Martha Berry for the watermelon pickle she had sent him. 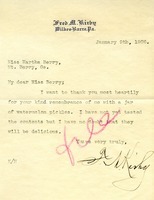 Letter to Martha Berry from Fred M. Kirby thanking her for sending him a jar of watermelon pickles.